One of the most popular vegetables to grow is the tomato. Tomato plants can be easily grown in a pot as well as a traditional garden. Tomato seedling plants are readily available at almost any retail location, even at the grocery store. However, as simple as they seem, they do require a little more attention then expected. 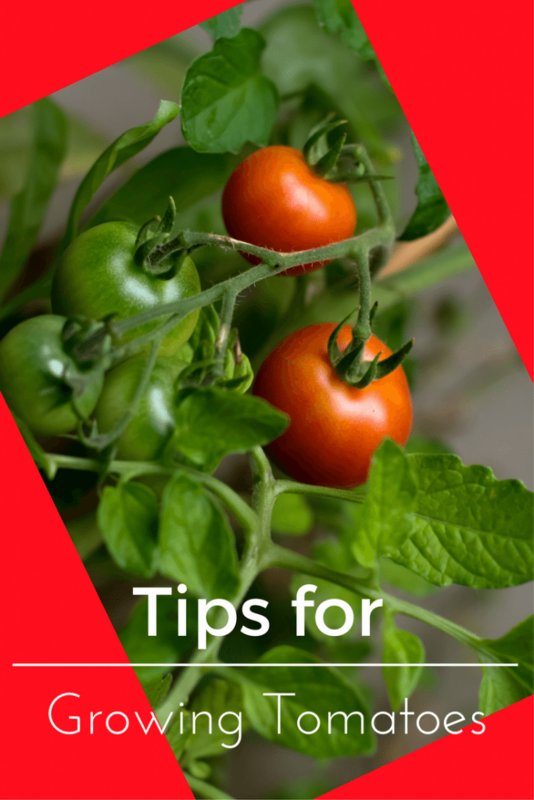 Here are Must See Tips for Growing Tomatoes in a garden or even a pot! This post may contain affiliate links. There are several varieties to grow from your basic Early girl, to Grape and Heirloom Varieties. Choose your variety based on your garden. A Grape or cherry tomato, also known as patio are good options for a pot. Save heirlooms and larger varieties for a tradition garden as they are often larger plants that require sufficient staking. Once you have chosen your variety, the work begins. You want to plant the seedling into your pot or garden as deep as the first set of leaves. This will allow for more stability and rooting. You can take off the first set of leaves before you plant. Now is the time to add the soil amendments such as egg shells or slow release fertilizer granules. Even though the plant is probably small, it is best to place any staking you will be using. Either a wooden tomato stake or tomato cage. This way you will not be disturbing the extensive rooting system later. I am not sure which one works the best, I am trying both this year. Once they plant starts growing, pinch some of the side shoots. This will promote growth of the plant, while also allowing air circulation. Every few weeks you are going to have to tie the growing plant to its stake or redirect limbs in the cage. Not only does Basil go well with tomatoes in the kitchen, but they are great companion plants in the garden. So plant an extra basil plant along side and reap the benefits. Pests and blossom rot are topics I am not that familiar with but will get info as it occurs to my plants. I do know squirrels will take a bite out of that tomato you were waiting just one more day to ripen and leave on the ground to rot. If you are finding this to be a problem, you can always pick them premature and place them, stem side down in a sunny window. They will continue to ripen just not vine ripened! I think we have all seen the advertisements for the Topsy Turvy tomato planter. My neighbor is currently growing two plants in one and several in her garden. The plant in the Topsy Turvy is growing gangbusters ahead of the other ones. Will be watching it in the weeks to come and give a report. Please add any additional tips or comments with your successes or disasters we can all learn from. Don’t forget to check your tomato plants morning and night for Tomato Horn Worms! Nasty green buggers! what great advice. I never knew that about squirriels I have tried cayenne pepper!! Rags soaked in ammonia and placed strategically around your garden will also deter squirrels, but you must re-soak them frequently. Also, examine your plants daily for hornworms this time of year. They can decimate your crop in the blink of an eye. They like to hang out on the underside of the plant leaves when they aren’t feeding. Remove them by hand and drop them into a bucket of soapy water to get rid of them. They’re too large and (shudder) juicy for anyone remotely squeamish to stomp them.